Make it a date night with us on a Wednesday, and join us for Steak & Wine Night. 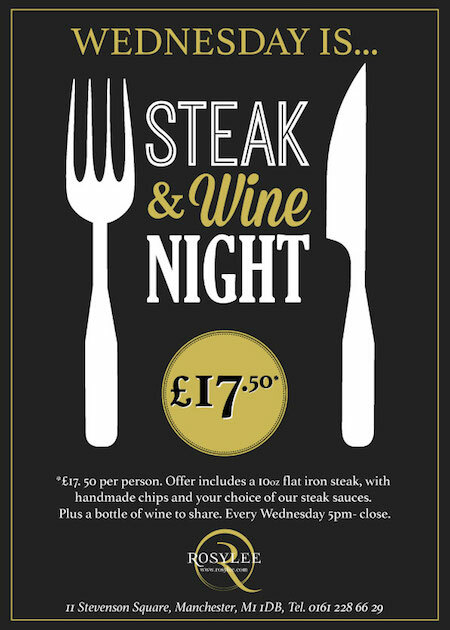 Make it a date night with us on a Wednesday, and join us for Steak & Wine Night. You’ll enjoy a succulent 10oz flat iron steak, lovingly cooked in our Inka grill, with handmade chips and your choice of our delicious steak sauces – all washed down with a good bottle of red wine to share. And all of this for just £17.50 each! Rosylee opened its doors in late 2013 as a traditional tearoom, but has evolved into a stylish restaurant and lounge bar, serving quality food and drinks. Guests can expect the service levels of a top restaurant, but with the warmth and easygoing atmosphere, which is synonymous with the city. The staff pride themselves on friendly service, and always strive to make your visit a memorable one. They hope to create a chain of beautiful restaurants across the UK, which value tradition and combine nostalgic tastes with modern gastronomy. Working together with local suppliers who produce only the best regional food, Rosylee is all about honoring the English heritage.